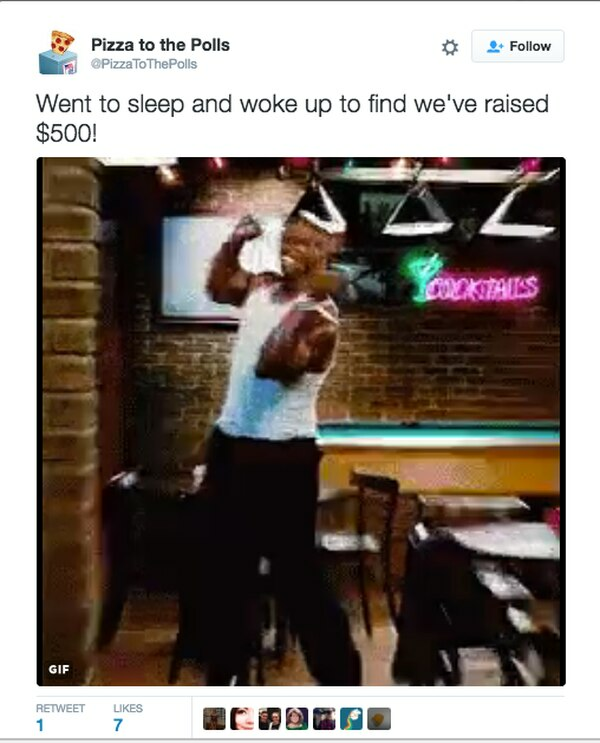 Just today, they've raised over $5,000. 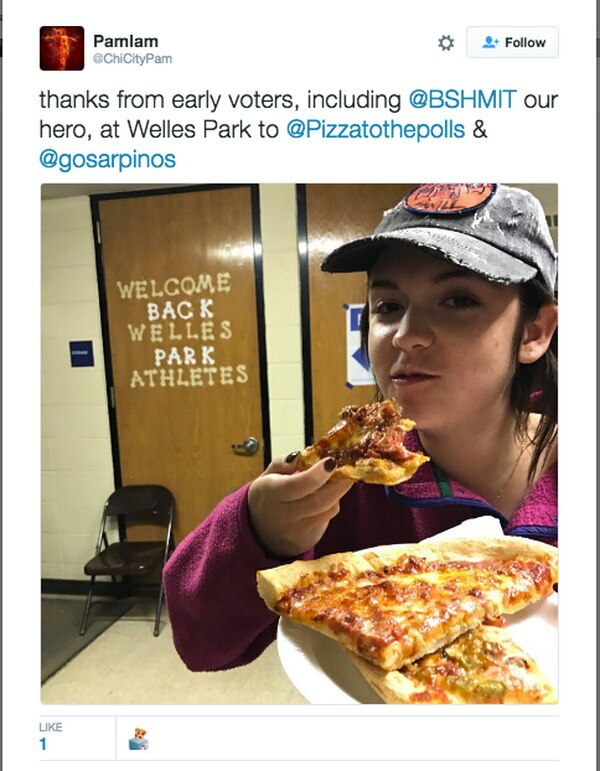 The Portland pranksters previously known as Americans Against Insecure Billionaires With Tiny Hands PAC have pivoted to a new project: Sending pizza deliveries to people waiting in line to vote across the nation. 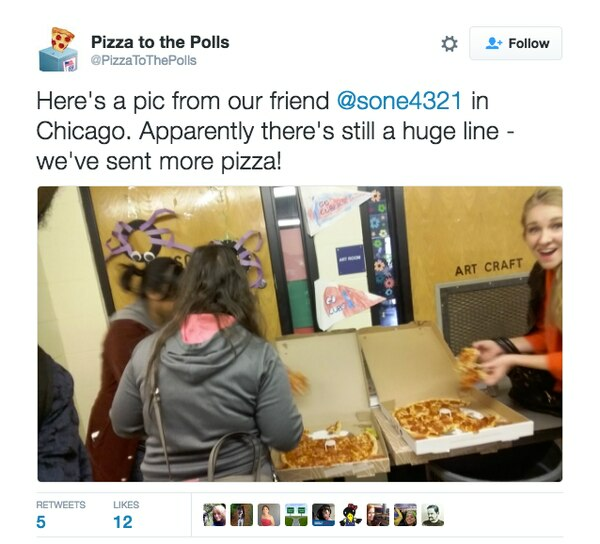 Since Sunday afternoon, the Oregon organization renamed Pizza to Polls has sent about 50 pizzas to lines around the country, including Miami, Cincinnati and Chicago. "We really didn't have a great endgame, but we had a good number of donations and people would still buy our shirts occasionally," says Scott Duncombe, treasurer of the PAC. "We were seeing the media reports about lines, and we were like 'this would be a good place to put some of the funds." Just today, they've raised over $5,000. 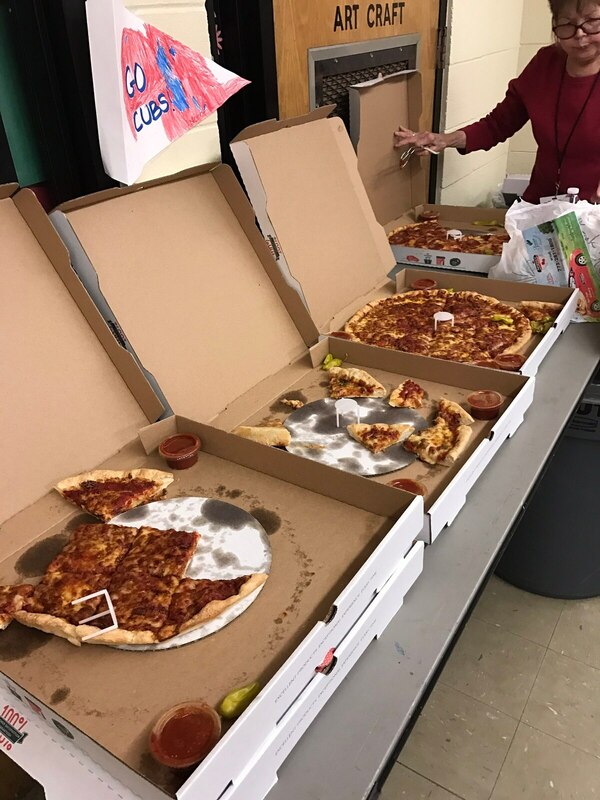 Combined with leftover PAC funds, the group has about $8,000 to send more pizzas. "I did not think we'd raise this much money; that really surprises me," he says. Now, Dumcombe says they'd like to get more pizza requests. You can report a long line and request a pizza here. 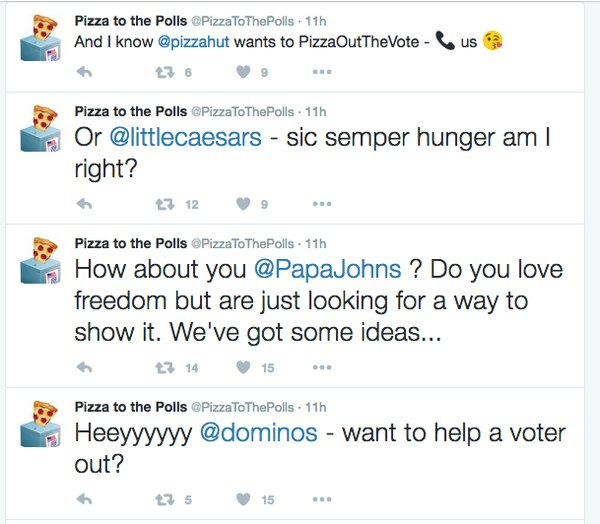 They're using a site called SliceLife, which allows them to type in an address to find nearby local pizza places, and then order online. Duncombe says the pizza places usually call him to verify his large, out-of-state orders. 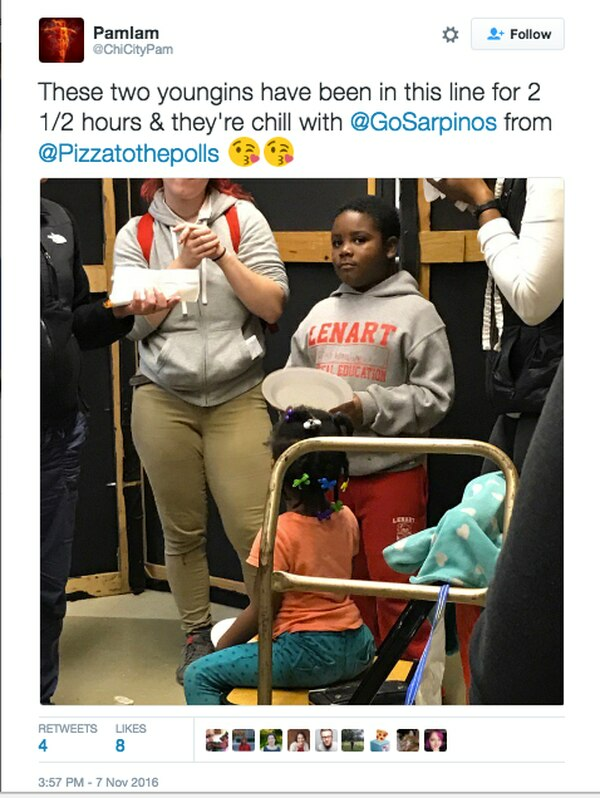 He has to tell them that he won't be there and just to hand pizzas to the people waiting in line. First, they would just trust that the pizzas made it there okay. Now, people are starting to Tweet pictures of the pizza. Duncombe fondly recalls his days working for the Bus Project and working at polling places with long lines, like in Colorado and Montana, when people would sometimes bring him pizzas. "It totally changes the environment for people there and encourages people to stay and turns it from being a grueling gauntlet to something a little more fun and civic," he says. 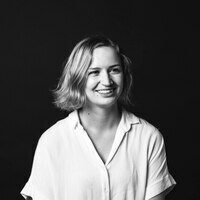 "It's been awesome to just see how jazzed people are getting about it. A lot of people are looking for a positive note and it's great to be that." 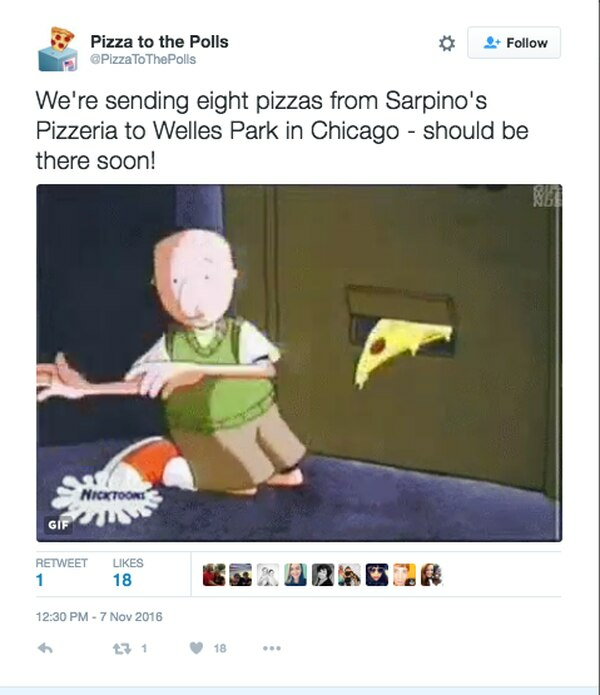 The group has been very active on Twitter, using an impressive number of pizza-related GIFs. "I've gone deep on that GIF search thing Twitter has built-in," Duncombe says. As far as slices go, they've mostly been sticking to the basics. "I tend to be pretty traditional. Yesterday, it was cheese and pepperoni, and I'd throw in a green pepper to kind of mix it up," Duncombe says. "No supremes or anything." He's also reached out to Pizza Hut, Little Cesar's, Papa John's and Dominos for donations, but has yet to receive a response. But the main question is can Trump's tiny little hands even hold a normal pizza slice? "Well it's interesting," he says. "There was that Daily Show clip where they had him eating a pizza with a knife and fork…maybe they're just too small."